The Greek words used for ordination are cheirotonia and cheirothesia, both of which mean "the laying on of hands." Members of the major orders of the clergy—bishop, priest, and deacon—are ordained during the Divine Liturgy by the bishop, who is usually assisted by several priests. According to Orthodox teaching, the process of ordination begins with the local congregation; but the bishop alone, who acts in the name of the universal Church, can complete the action. The ordination itself for those entering the major orders takes place within the altar. Those who are placed into the minor orders (subdeacon, reader, and in some traditions, chanters) are done so by cheirothesia, which also means "laying on of hands," but has come to be a technically distinct term from cheirotonia, which is used only for the major orders. Cheirothesia is not regarded as part of the Holy Mystery of ordination. The ordination for those entering the minor orders takes place within the nave of the church. It is also the Orthodox conviction that Christ has not abandoned his people, but that he remains with his Church as it’s living and unique head. Christ remains present and active in the Church through his Holy Spirit. The sacrament of holy orders in the Christian Church is the objective guarantee of the perpetual presence of Christ with his people. The bishops, priests, and deacons of the Church have no other function or service than to manifest the presence and action of Christ to his people. In this sense, the clergy do not act in behalf of Christ or instead of Christ as though he himself were absent. They are neither vicars of Christ, nor substitutes for neither Christ nor representatives of Christ. Christ is present now, always and forever in his Church. The sacramental ministry of the Church—the bishops, priests, and deacons—receive the gift of the Holy Spirit to manifest Christ in the Spirit to men. Thus, through His chosen ministers, Christ exercises and realizes His unique and exclusive function as priest, perpetually offering Himself as the perfect sacrifice to the Father on behalf of His human brothers and sisters. Through His ministers in the Church, Christ also acts as teacher, Himself proclaiming the divine words of the Father to men. He acts as the good shepherd, the one pastor who guides His flock. He acts as the forgiver and healer, remitting sins and curing the ills of men—physical, mental and spiritual. He acts as bishop, overseeing the community which He has gathered for Himself (1 Pet 2.25). He acts as deacon (which means servant or minister) for He alone is the suffering servant of the Father Who has come “not to be served, but to serve, and to give His life as a ransom for many” (Mt 20.28). As the apostles received the special gift of God to go forth and to make Christ present to men in all of the manifold aspects of his person and work, so the clergy of the Church receive the gift of God’s Spirit to maintain and to manifest Christ’s presence and action in the churches. It is the doctrine of the Church that the clergy must strive to fulfill the grace given to them with the gift of the “laying on of hands” in the most perfect way possible. But it is also the doctrine of the Church that the reality and effectiveness of the sacraments of the Church ministered by the clergy do not depend upon the personal virtue of the ministers, but upon the presence of Christ who acts in his Church by the Holy Spirit. In the Orthodox Church, the office of bishop is the leading Church ministry. The word bishop (episkopos, in Greek) means overseer. Each of the bishops has exactly the same service to perform. No bishop is “over any other bishop in the Church” and, indeed, the bishop himself is not “over” his church, hut is himself within and of the Church as one of its members. He is the one who is responsible and answerable before God and man for the life of his particular church community. All bishops of the Orthodox Church are bishops of a particular geographical territory called a diocese. They usually receive their title from the main city in the territory. A bishop of the chief city of a region which has within it other bishops with their own particular dioceses is usually called the metropolitan or archbishop. “Metropolitan” merely means “bishop of the metropolis,” the main city. The title of archbishop means “leading bishop” of an area, but sometimes the title is given to certain bishops for personal or honorary reasons. The title of patriarch belongs to the bishop of the capitol city of a region containing other metropolitanates and dioceses. Today this usually means a national church. When the bishops of an area meet in council, as they must do periodically according to Church Law, the metropolitan presides; or in the case of a large territory or national church, the patriarch. Once again, however, it must be clearly understood that sacramentally all bishops are identical and equal. None is “higher” than the others as far as their sacramental position is concerned; none is “over” the others as far as their life in the Church is concerned. In purely human and practical matters, the metropolitans and patriarchs guide and preside over areas greater than their own particular dioceses, but they are not superior or more powerful as far as their bishop’s office is concerned. No bishop in Orthodoxy is considered infallible. None has any “powers” over or apart from his priests, deacons and people or the other bishops. All are servants of Christ and the Church. Since the sixth century it has been the rule in the Orthodox Church that the bishops be single men or widowers. They are also usually in at least the first degree of monastic orders. The deacons of the Church originally assisted the bishops in good deeds and works of charity. 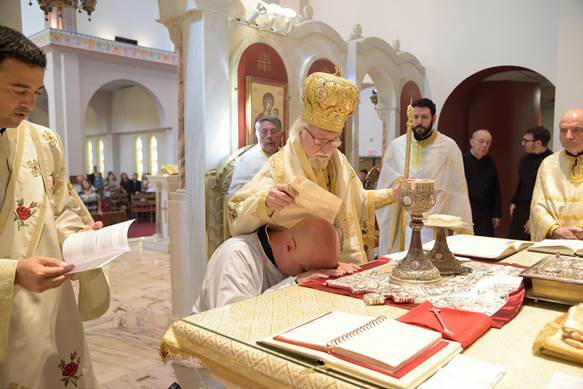 In recent centuries the diaconate has become almost exclusively a liturgical function in which the deacons assist at the celebration of the divine liturgy and other Church services. In more recent times, the diaconate has been extended to many as a permanent position for full or part-time service to the work of the Church. In the office of deacon, the men may now not only assist the priest and bishop in liturgical services, but will often head educational programs and youth groups, do hospital visitation and missionary work and conduct projects of social welfare. In these cases the deacons are not necessarily taken from the professional schools of theology, but are chosen directly from the local parish community. The Church’s rules about marriage are the same for the deacons as they are for the priests.